It’s a brand new year folks and I am very pleased to say that from a music standpoint things are starting off in a grand fashion. 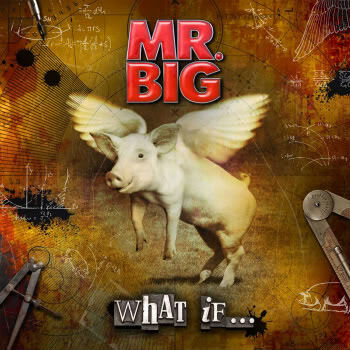 Mr. Big’s “What If” is the first major release of 2011 and it is a doozy. Produced by Kevin “Caveman” Shirley”, “What If” is a huge rock album that offers a great mix of both modern and retro elements. A definite heavy modern rock feel, but never looses that classic Mr. Big sound and feel. Eric Martin’s voice is in tip top shape as is Billy Sheehan’s nimble bass slapping fingers and Paul Gilbert’s amazing guitar slinging. And let’s not leave out Pat Torpey back there pounding the skins like his life depended on it!!. 1.) “Undertow”– The first single off the album. When I first heard it a couple months ago I was blown away. Classic Mr. Big, great chorus! 7.) “As Far as I Can See”– Probably the best example of classic/modern hybrid. 8.) “All The Way Up”– A great mid-tempo rocker. 9.) “I Won’t Get In My Way”– Big attitude song and Paul Gilbert playin’ all over this song. 11.) “I Get The Feeling”– Probably my favorite track on the album. Big classic rocker with a huge chorus and great guitar riff. Considering how many years its been since these guys have played together it is amazing they are still so tight, like a well oiled machine. It is truly a shame that America has still not caught up with the rest of the world in realizing what an amazing band this is. Totally agree on what you said about America not catching up on how amazing Mr. Big is man! Most of their tour schedule for 2011 centers around Japan man…..which is a pity! More of the younger gig audiences in the states and Europe should be exposed to this type of PROPER melodic hard rock!